Planting on the inside of the deck will hide the retaining walls. On the outside edge of the deck we will install Corten steel planter boxes. The planter boxes will provide both a dramatic and a practical solution for garden beds - and will be much easier for the homeowner to look after. We’ve used recycled hardwood sleepers for the steps. These massive sleepers were hard, hot work to get in, but worth it! 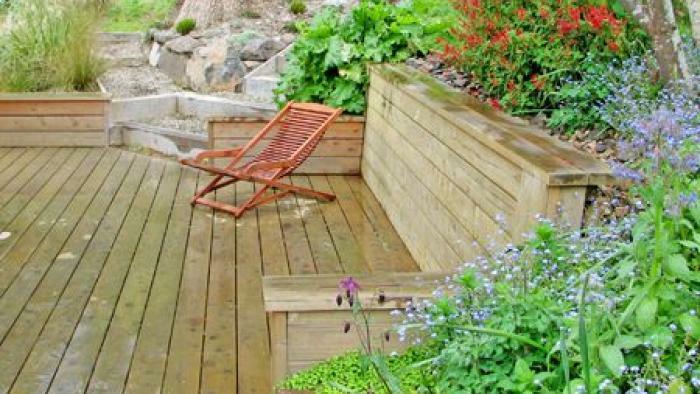 They provide a nice contrast with the new timber deck and give a solid feel to the overall landscape design. Local Port Hills volcanic rocks have been used break-up and provide contrast with the straight lines defined by the deck and steps. On this Christchurch hillside property, the decks will lead to a circular paved area with built-in seating. Perfect for views over the city to the mountains and for entertaining family and friends. On a hillside there are many construction challenges - access, retaining, drainage, etc. Achieving usable and useful space in the most cost effective and aesthetically pleasing way is the object. With careful planning and construction this is achievable.